Today in the Dogon village of Djiguibombo we learnt how to make tô - a kind of thick millet porridge which is pretty much the staple food in this part of Mali. 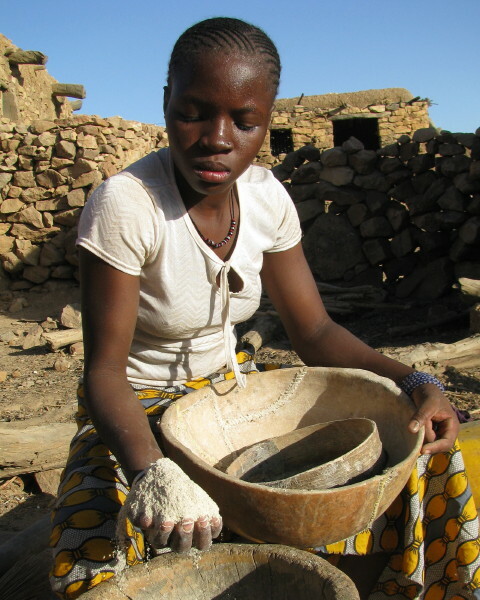 We learnt from an expert: Aminata, who is 15 and has been making the tô for her whole family since her mother died some years ago. 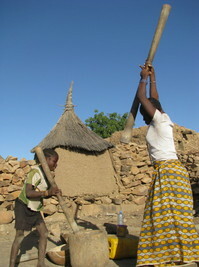 And we realised how hard work it is: you have to pound the millet into flour by hand in an enormous mortar & pestle. Just listen to how hard she hits it. It's worth listening to this using headphones or proper speakers - on laptop speakers you can't really hear the bass sounds of the pounding properly.